Last month I shared a lengthy list of novels in verse with the Poetry Friday community. Well, mark your calendars, because this Tuesday, August 9th marks the debut of another great addition to the list. 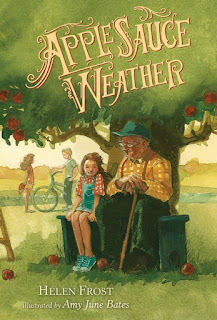 Applesauce Weather (2016) by Helen Frost and illustrated by Amy June Bates is a short middle grade novel in verse. The poems alternate between several voices: brother and sister pair Peter and Faith, their great-uncle Arthur, and chapter breaks labeled "Lucy's song" in the voice of their recently-deceased great-aunt Lucy. The action of the story happens over the course of the brief applesauce-making season with digressions into family stories (or perhaps tall tales) from the past. a sunflower high as a house. she'd breathe in deep. She'd smile wide. 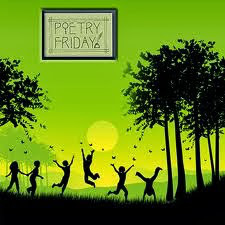 Tara has this week's Poetry Friday roundup at A Teaching Life. Sounds charming. What lovely language in that shared poem. Thanks, Brenda! The author does a nice job with the different "voices" of the characters. I enjoyed this nostalgic book, too, Katie, think it might make a good mentor text for some narrative writing! Absolutely, Linda. It has lovely language for any type of family story. I've had my eye on this book and can't wait to read it and add it to my middle school collection. We have several of this author's books and I get them into student and teacher's hands whenever I can. Thanks, Linda. I will definitely be seeking out more books by this author.